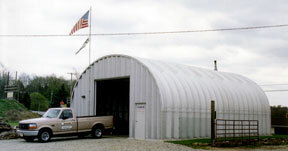 S-Model steel buildings are the perfect solution for industrial, commercial, agricultural, or homeowner uses. Whether your application is for an industrial shop building, truck repair garage, commercial boat storage, warehouse building or a farm equipment building, the S-Models offer the most economical steel building cost. Many industrial companies utilize this model as it offers a high vertical sidewall but also has excellent height as well throughout the building. This makes it ideal for pre-engineered steel warehouses using shelves or large racks right at the wall or raising large trucks for repairs anywhere in the building. The arched roof also provides excellent strength against heavy snow loads and hurricane winds. If you need specific dimensions or inside clearance, the S model can be customized to your requirements so you can maximize the building space available. They are available from 12-50 feet in width and virtually any length. The S-building can be easily expanded at a very low cost as your operation grows; just unbolt the endwall and add on additional arch spans. Since there are no roof trusses or posts, you can add a second floor or cheap storage, with a loft above the ground floor. Archcore S models are the most economical, multi-use pre-engineered commercial steel buildings for sale anywhere! Every S model building is manufactured with Galvalume® steel that has a patented coating consisting of aluminum, zinc and silicon. It offers the best corrosion protection available and comes with a 30 year warranty backed by the U.S. Steel Mills against rust perforations. Since the buildings are all preformed and predrilled, most models are simply designed for the do-it-yourselfer to erect with general labor and do not require heavy equipment or hoists to raise up. Call Archcore now for a price on your own custom S-Model commercial steel building at 1-800-844-1570 or request a fast online price quote. The S-Model features a super-straight wall design for efficient space usage and ventilation. A remarkably affordable building that is ideal for use as an airplane hangar, sandblasting and small manufacturing operation, truck, boat, and RV storage, and for farmers to protect livestock and equipment. View The Gallery of S-Model Steel Buildings!